Bead, glass, opaque black, 6mm faceted bicone. Sold per pkg of 35. 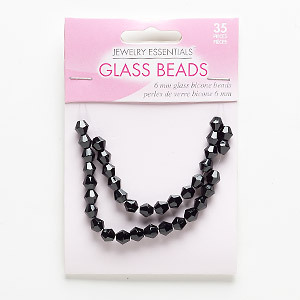 Bead, glass, opaque black, 3-5mm faceted bicone. Sold per 12-inch strand. Bead, glass, spring green, 6-7mm faceted bicone. Sold per 12-inch strand. Minimum 2 per order. Bead, glass, opaque white, 3-5mm faceted bicone. Sold per 12-inch strand. Minimum 2 per order. Bead, fire-polished glass, transparent clear AB, 6-7mm faceted bicone. Sold per 19-gram vial, approximately 80 beads. Bead, glass, 16-facet, transparent orange AB, 6mm faceted bicone. Sold per 15-1/2" to 16" strand. Bead, glass, 16-facet, transparent yellow AB, 6mm faceted bicone. Sold per 15-1/2" to 16" strand.